The kid has been squatting in her sister's old room, last "decorated" when said sister was 2, and has never complained once. Never mind that this very same sister has been the recipient of two bedroom makeovers, including one that was designed for a magazine shoot (i.e. we blew it out). Clearly it's high time that the Millster got her due. Enter "Operation Millie's Totally Awesome New Purple Bedroom" (her title). Ok, confession time. I've been acting all freaked out about the purple thing, but it's all a big charade. I love freakin' purple. Love it. It's my secret guilty pleasure. In fact, purples's been my jam since I was a Prince-obsessed tween. We've been pinning for months. Scheming. Strategizing. Negotiating. Millie was a tough customer. Scratch that. She was the Hardest. Client. Ever. (Kid's got an opinion.) And finally we settled on the design direction happening in that moodboard above. Finally. Now it's go time. 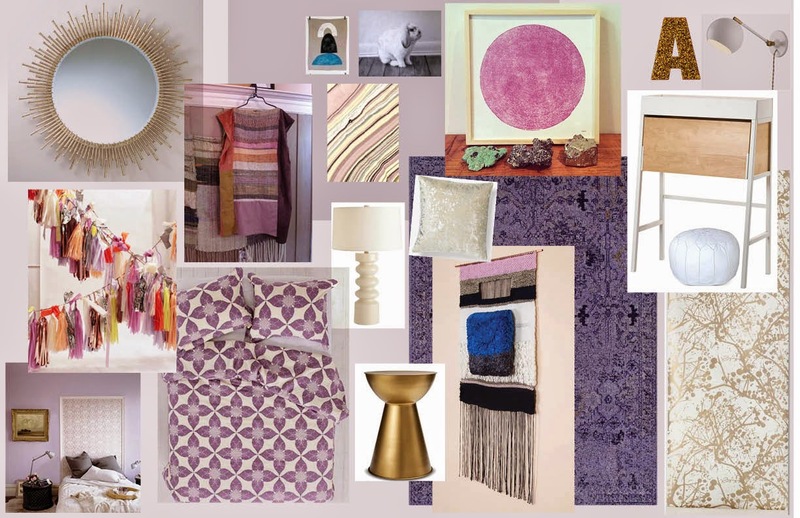 We swathed the walls in Benjamin Moore's Majestic Mauve last week. Curtains were procured. A new rug is in route. Art is being pondered. I've cajoled Bryan into some IKEA hacking action. It's all coming together.